Well the final count of the number of wild horses caught and reported to the SRD is 218. This according to our estimations is over 40% of the wild horses that once roamed free. We feel that this is an atrocious number of the magnificent wild horses to be removed from their natural environment for so many frivolous reasons. This number is still being endorsed as the “proper” number by the SRD to be removed. How callous. We would like to clarify some of the errors stated by the minister in charge of the SRD, Frank Oberle, in the typical response letter to concerned Albertans. In his letter he admits that horses were indigenous in North America but became extinct. He then states that what we call wild horses are just descendants of horses that have escaped captivity or turned loose. Because of this SRD considers them as an “exotic” species and therefore vermin and not be be protected. It is amazing, however, that some of the leading archeologists, biologists and geologists consider that the horses are an indigenous species of animals to North America. There is even now some speculation as more is learned about North American native history that the horses may never have become totally extinct. This research is still in its infancy. He further states that the government considers them feral and that they fall under the Stray Animal Act and Horse Capture Regulations. 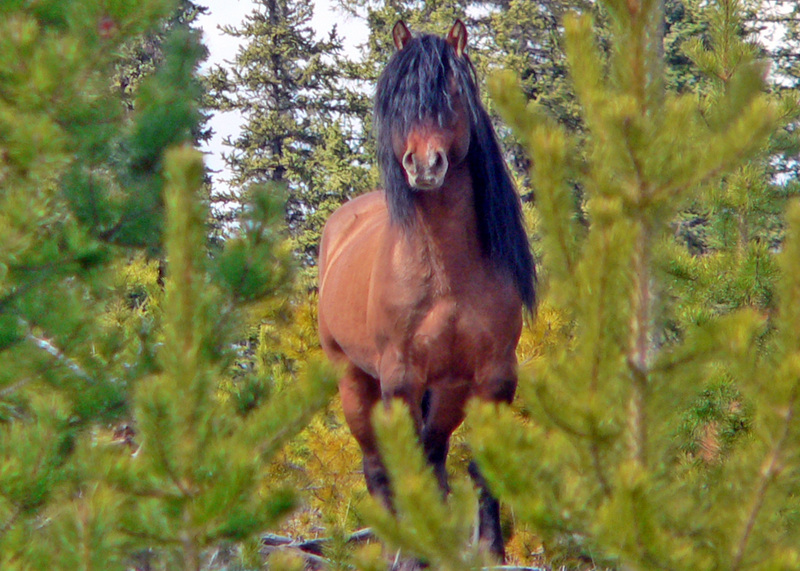 This allows the SRD to designate on crown land (our land) where the wild horses can live. Also that those getting the capture licenses are screened to assure that captures horses would be treated in a humane method. Further, he states that the staff monitor theses regulations and the capture. He also notes that only 30 horses on average are captured each year. Since WHOAS inception in 2001, we have maintained that these regulations do little to properly protect the wild horses. Having been told to our face, by officials of the SRD, that they can interpret the regulations as they see fit. This was quite evident this year when basically the regulations were completely disregarded in order that the SRD’s magic number (218) could be removed. This included the monitoring of pens, capture ratios and any other component that stood in the way of this level of numbers to be removed and mostly sent for slaughter. Mr. Oberle states that from 2009 when there were 650 horses, to 2010 where he says there were 1,000 feral horses identified in the Eastern slopes. This is completely impossible biologically. We have learned that the way the numbers are calculated by SRD is by a multiple factor. Therefore if they fly over a particular area and see a large number, they just multiply this times the total area where they think wild horses may exist. This manner of counting where representatives have even stated on public television and in newsprint are accurate is obviously flawed. In my years of studying the wild horses there are large tracts of land where you do not find the wild horses. But they include these areas in their count as having a population. 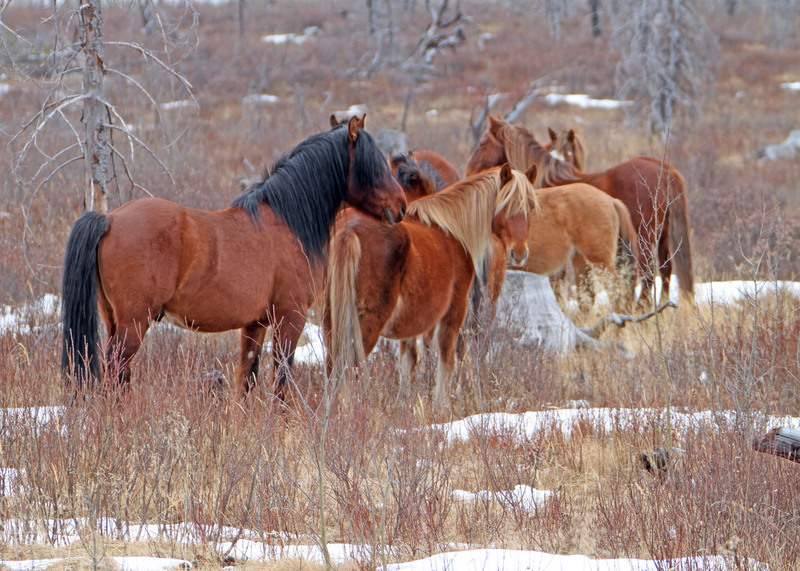 In his letter of rebuttal to concerned Albertans, Mr. Oberle again states that horses are eating the forage and damaging the rangeland making less available for cattle and other wildlife. In our studies and observations this is just conjecture on the part of those opposed to those who want to see the wild horses eradicated. 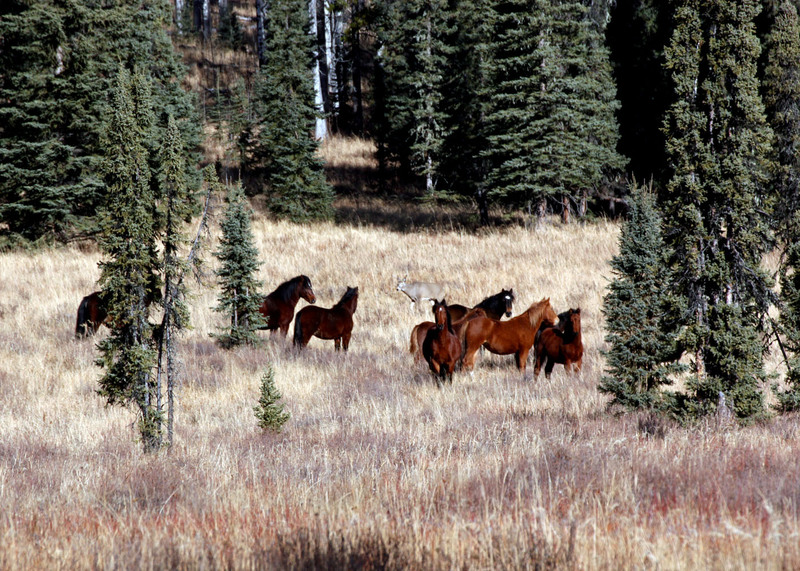 The above picture shows horses in a meadow sharing it with deer and both species have used this area all year. The most damage we see to grasslands and stream banks is in areas where herds of cattle were moved in and left to graze over the summer months. Do not forget that in an area that has maybe 400 head of horses left, over 10,000 head of cattle are moved in for the summer and fall months. In our travels in valleys that used to be lush and used for prime wintering grounds for elk and deer, the grass has been eaten down by the cattle, therefore the elk and deer are unable to winter in these areas. Also noted is the fact that wild horses are grazers and are always on the move, never settling down in an area to destroy the grasslands, like cattle do. Then he states they impede forest regeneration by damaging young seedlings. This is completely false. This is the claim of the large logging companies in their arguments against the wild horses. 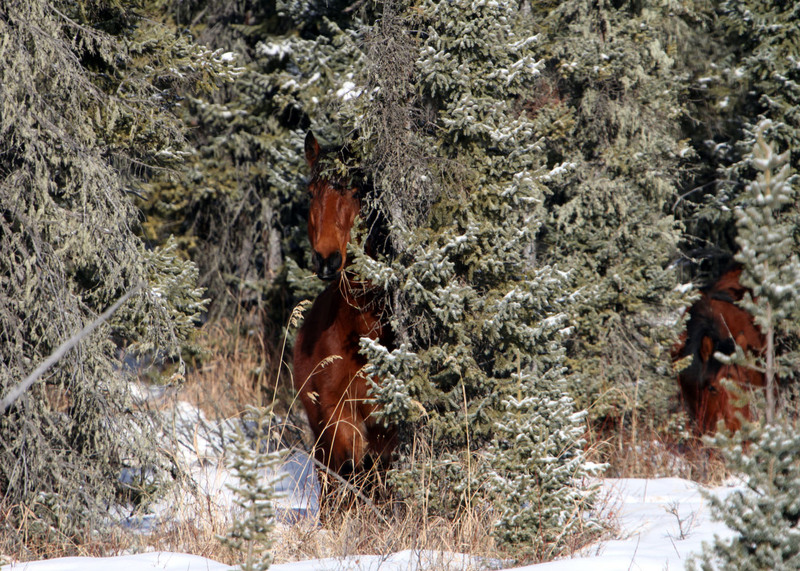 It is proven that horses do not eat pine trees and in fact by grazing in these areas they actually help the growth of the seedlings. 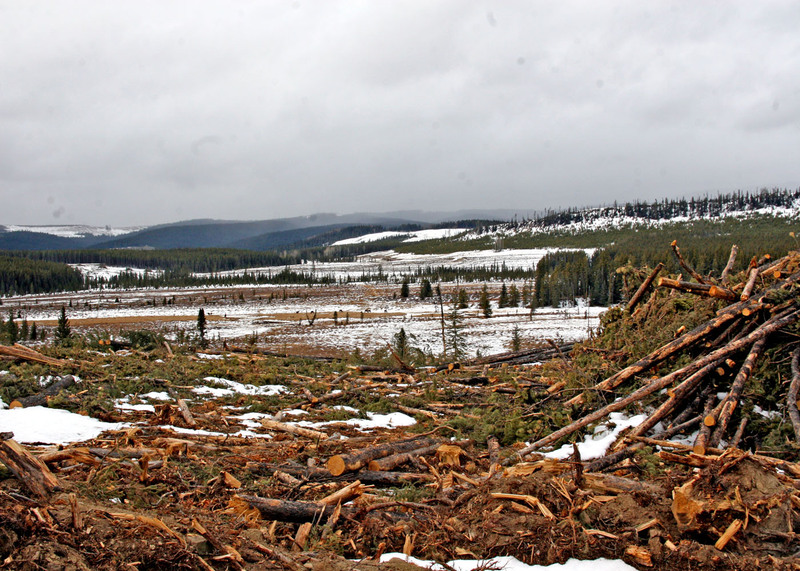 Now if the logging companies, West Fraser and Spray Lakes, want to claim damage to the envirnoment they only need to look at what they are doing with their clear cutting. Botanists studying forests and forest growth talk about the need for diversification throughout. In doing their clear cutting, the logging companies destroy the mosses, other plant life and untold numbers of small creatures including bird habitat. Then they replant the forest with alleged money-making species of trees (pine) therefore changing the forest forever. Soon you may only see the natural forest in a national park, since the SRD is allowing clear cutting even in areas like the Kananaskis. The last point the minister states that because of the increased numbers they are moving eastward and becoming hazards on public roadways. This point is completely ludicrous. For one thing, the horses are not moving east and they do not stay on roadways, always moving quickly across them. Now ask anyone hauling the camper or holiday trailer traveling the forestry roads what the most dangerous animal on the roadway, when you find whole herds of cattle laying in the middle of the road. The cattle also have to be driven off the road in order for a vehicle to safely manoeuver through them. So the minister’s letter is full of conjecture and unsubstantiated facts provided to him presumably by our public servants who have their own private agenda working with big money interests and not in the interests of most Albertans. If one wants to use their arguments against the wild horses, WHOAS would like to offer up some conjecture in regards to the clear cutting practices that is endorsed by the SRD officials. When you clear massive areas of mature forests, scientists around the world claim that this leads to global warming. Governments criticize the cultures in the equatorial areas for their clear cutting efforts and the effects this is having. Why not look in our own backyard. What about the winds? Has anybody noticed the increase in the ferocity of the winds in this part of the province? Could it be because the forests have been extensively removed that wind patterns have changed? We could go on and on with conjectures like this, as the government and industry does against the wild horses but our point is do not use arguments against that wild horses that are unscientific and unfounded.